I pink puffy heart hearts. Especially when they’re edible! I have a problem. A heart problem. Every Valentine’s Day I make all food into hearts. Heart shaped pancakes. Heart shaped sandwiches. Heart shaped cookies. Heart shaped pizza. It’s one of those things, like Elf on the Shelf, that is all Jordan knows. So if I don’t do it, I’m in a load of do-do. So I do it. I make hearts out of everrryyyything. Have you ever turned a cinnamon roll into a heart? It’s super easy. Then you can stick them on sticks, tint the icing pink, bathe them in sprinkles, and you have a pink puffy heart heart cinnamon roll. These make a great Valentine breakfast. Or they make an awesome teacher or BFF gift. Want to know how to make them? Great! Click on over to the Pillsbury website, where I wrote a whole post and did a whole photo tutorial! 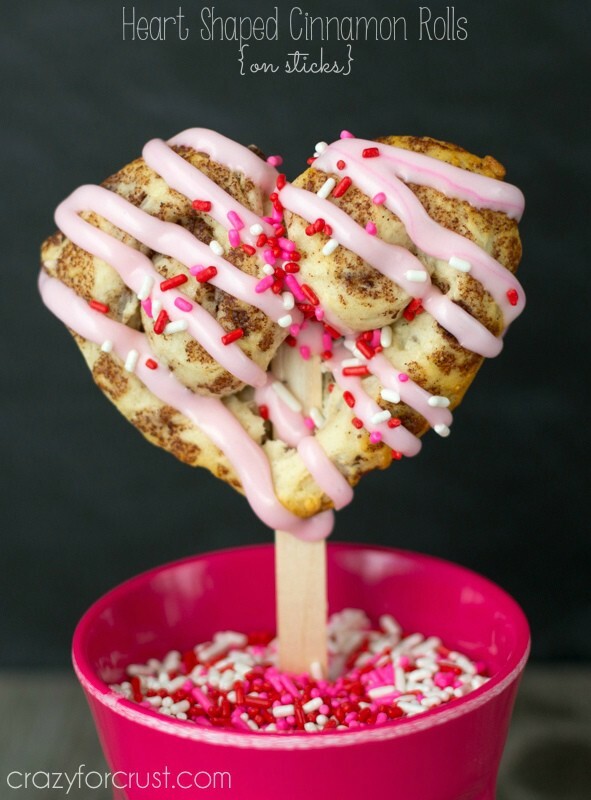 So go figure out how to make these Heart Shaped Cinnamon Rolls on sticks over at Pillsbury! ….in case you missed it… Click HERE for the recipe! These are just too cute and I’m sure that they taste amazing! Pinned because I love pink puffy hearts too! I would love to be at your house on Valentine’s Day! Great ideas, Dorothy! These are just too cute! I love how they are made with premade dough – so easy. It doesn’t get much cuter than these heart shaped cinnamon rolls! These are SOOO cute, Dorothy. AND they look delicious. Thank you!! I love heart shaped food! So adorable… looks delicious, to boot! These cinnamon rolls look amazing! AND They’re totally adorable! I really love what you did with them, it’s the perfect gift! Thanks for sharing! !